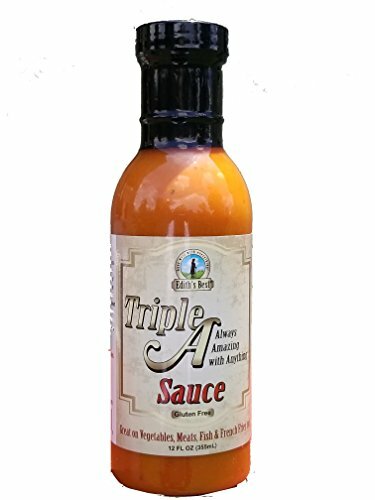 Triple A Sauce is a high quality, health conscious, multi-purpose sauce that eliminates the need to purchase and array of different condiments. It's versatility allows it to be used in an endless array of options on meats, fish, vegetables and french fries too! We believe it's the Triple A Sauce- Always Amazing With Anything! Brand New Name! Same Great Taste! Edith's Best, Triple A Sauce is a high quality, health conscious, multi-purpose sauce that eliminates the need to purchase and array of different condiments. Its versatility allows it to be used in an endless array of options on meats, fish, vegetables, seafood and french fries too! We believe it's Always Amazing With Anything! Consists of a blend of ingredients that delivers a southern style flavor. An initial sensation of spiciness that flows into a tangy and slightly sweet experience. If you have any questions about this product by Edith's Best, contact us by completing and submitting the form below. If you are looking for a specif part number, please include it with your message.